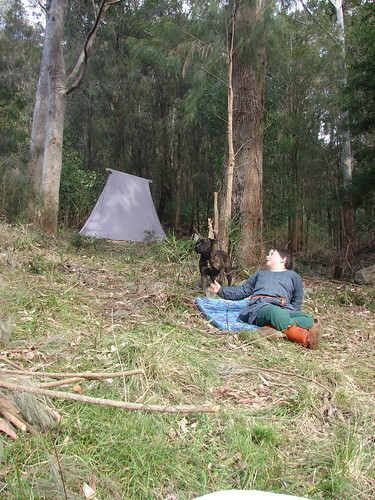 We went camping with the Huscarls on the weekend and to be perfectly honest I didn’t have much fun. I don’t mind roughing it a bit but I object very strongly to not having any flat ground to sleep on – sliding feet first off my bed multiple times through the night does not make me happy. There were other problems too but I don’t really feel like going into them here. Suffice to say I’ve had better weekends. Which isn’t to say there was nothing good about the weekend. The kids certainly had fun. The weather was good. Clara had fun (I’d have been happier if she hadn’t been growling at wallabies in the wee small hours of the morning, but hey, I was awake anyway on account of the whole sliding off the bed thing). There was interesting food that was new to me and I’m all for exploring the new. 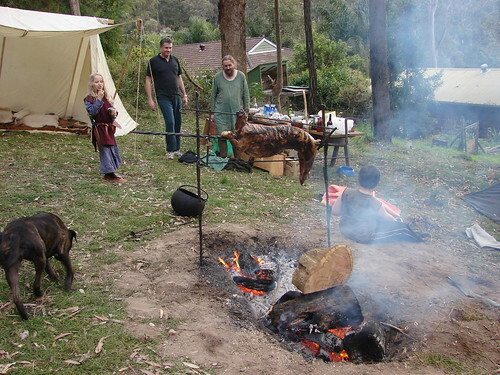 The guys had bought a whole goat which they roasted on a spit over the open fire. It was basted with a honey marinade and stuffed with grapes, bread and I believe barley. It was pretty good as was the veggie stew accompanying it. Leftover goat was added to the stew and served up for breakfast the next morning and that was seriously yum. Adam cooked porridge in one of the smaller cauldrons. 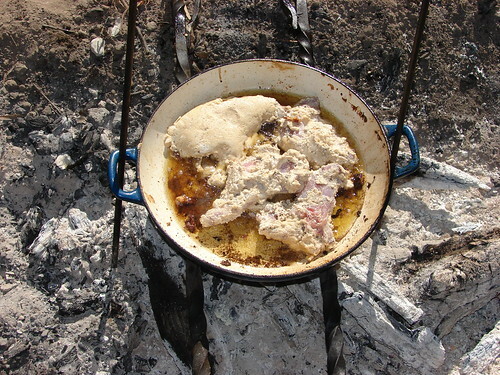 Lunch on Sunday was rabbit cooked in buttermilk. Plus, I wasn’t in charge of the cooking and that’s always a good thing. I actually felt quite guilty at how little I did to help, I’d have done more on the Sunday but by then I was feeling somewhat worse for wear (I had a thumping headache and felt nauseous which in hindsight may have been due to smoke inhalation). So yeah, I have mixed feelings about the whole experience. Tom, Clara and geteld on a hill. 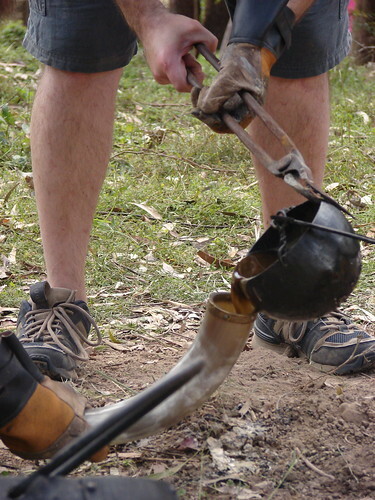 Waxing Adam’s drinking horn to seal it. Adam sitting outside our tent (a Viking a-frame). 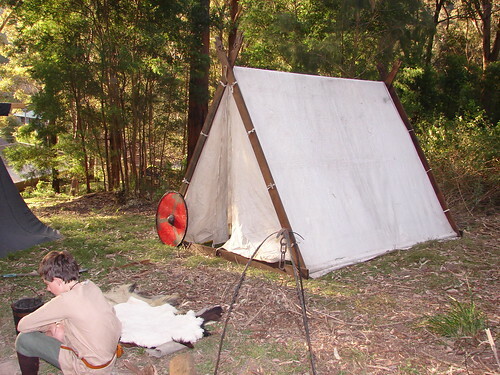 Viking a-frame tent with shield. Still watching the goat cook (it took 7 hours). I’ve stolen Adam’s seat. 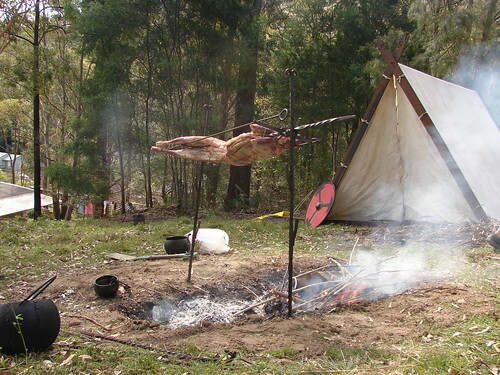 Rabbit being prepared for Sunday lunch. 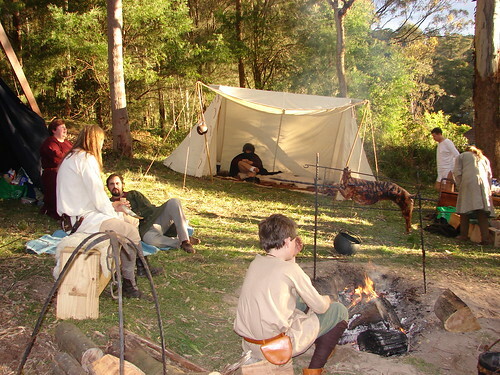 At least you can tick ‘go camping with the Huscarls’ off your list :). 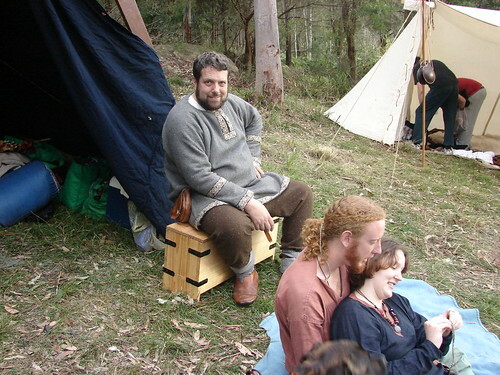 I didn’t know cargo shorts and sneakers were popluar in viking fashion! I’d be totally up for most of that BUT I need a bed! I’d make sure they camped near a good hotel, Set up with kids and Adam and then say: “OK see you in the morning…” Have a hot bath, and good sleep.